The Nokia X6 is company’s latest mid-range device which launched recently in China. 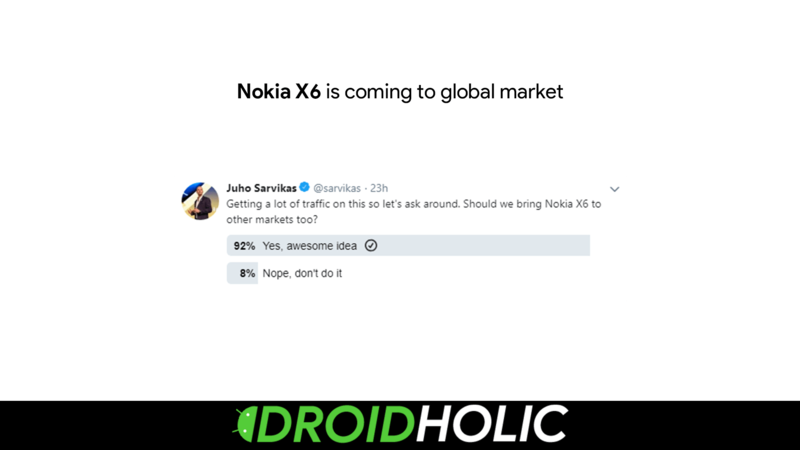 Till now, there was no official word from Nokia or HMD on the launch in other markets outside China but recently, a Twitter poll by the CPO of HMD Global, Juho Sarvikas, confirmed that the company is planning to launch the X6 in other markets as well. In fact, there are now rumors of Nokia X5 and X7 to launch soon. Nokia X6 Global Launch Soon? Till now, more than 90% of the votes are in favor of launching the Nokia X6 in other markets. India is one of the largest markets for Nokia, and the company will surely want to launch the phone in India at an aggressive price to compete with the phones like Redmi Note 5 Pro and the Asus Zenfone Max Pro M1, both of which are powered by Snapdragon 636 (the same chipset powering the X6). Bluetooth 5.0, 3.5mm headphone jack, GPS, GLONASS, etc. The price starts at 1,299 Yuan or $205 for 4GB + 32GB variant in China and goes up to 1,699 Yuan or $266 for the 6GB + 64GB variant. If the device launches at the same price in the global market, it can be a big hit. What are your expectations for the pricing? Do let us know via the comments section.